To kick off the spring semester, nearly 40 CSU Monterey Bay and Ohlone College faculty members came together to explore discipline-specific literacies through an Introductory Reading Apprenticeship workshop at CSU Monterey Bay on January 17, 2017. These faculty members teach in diverse disciplines and learning contexts, including Cinematic Arts and Documentary Film Production, English, First Year Seminar, Chemistry, Physics, Library, Nursing, and many more. Throughout the day, the participants practiced key Reading Apprenticeship routines and engaged in metacognitive conversations to examine various approaches to embedding metacognitive conversations into courses across the disciplines. 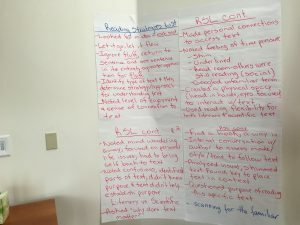 In one of the interactive portions of the workshop, the participants generated a robust Reading Strategies List (see 1st picture), leading to rich conversations about leveraging students’ strengths while scaffolding particularly challenging texts to support students’ construction of meaning and problem solving. 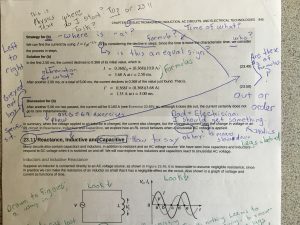 Speaking of problem solving, the 2nd picture shows that work the group did to unpack a Physics text using a combination of a Think Aloud and Talking to the Text. Thank you to CSU Monterey Bay for hosting this engaging workshop.